Welcome to Ella`s lab where she works to clone her beloved pet Bob (Biological One-Eyed Blob)! 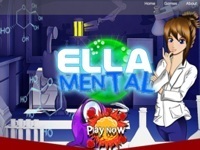 Ella Mental is a bright, colourful 20 win line multi-bonus game, with heart-pumping music and astounding visual effects. Mix together 2 flasks of chemicals to create a solution €“ Solid, Liquid, Gas €“ with winning results! Two exciting free spins features with player choice. The random Chain Reaction features Free Spins until you win! Mister Money - Bonus Feature 20 Line Slot from RealTime Gaming. Rain Dance - Bonus Feature 20 Line Slot from RealTime Gaming. Red Sands - Bonus Feature 20 Line Slot from RealTime Gaming.